Every keen cook and small holder is interested in butchery. A basic knowledge of the terminology & skills involved is crucial to get the most from the meat you raise or buy. The Butcher’s terminology can be daunting though and not many people have actually seen a carcass broken down into its various cuts. Our practical Introduction to Butchery one-day course is led by two expert butchers, John Griffin and Declan Gilmore. The course will provide an introduction to the art of butchery. This course is essential for the real meat lover! The course has been designed to meet all levels of interest and experience. Our course numbers are kept small so you will have time to learn in a hands-on way. Places on this course cost just €175 which includes all course materials, lunch and some goodies to take away. The day starts with an introduction to the Butcher’s tools of the trade and we’ll learn about their care and safe use. We’ll also talk about how the raising of the animal has a huge impact on muscle structure and carcass quality. We’ll also talk about the effect of hanging on the flavour and textures of meat cuts. In the morning session, our Butchers will guide you through the butchery of a Hogget (a sheep that is over a year old). 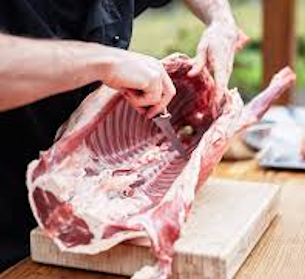 This will be a hands-on session and you will have the opportunity to practise your knife skills and examine muscle structures as we break down the sheep. Not surprisingly, this will be a meaty affair! In the afternoon, you will take to the butcher's block again and, as a group, butcher a Deer into its primal cuts. Venison is a fantastic meat that is rich in flavour. It is often considered expensive or hard to source. On our course, you’ll learn how to source and butcher a deer to create a range of delicious products and dishes. 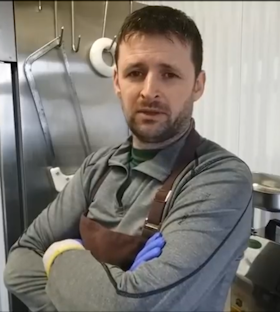 John Griffin will guide you through every step in the process of the butchery of the deer from skinning to transforming the carcass into oven ready cuts and even Venison Burgers! Of course, no Introduction to Butchery course would be complete without some Sausage Making! We’ll finish the day compiling delicious recipes for Pork Sausages and our Butchers will show you how to stuff and link your own sausages, ready to take home with you! - Includes: All equipment, notes, recipes, lunch & some goodies to bring home. Some cottages are available for the weekend of the course. Bring your family along and enjoy a weekend in Kilkenny. "I very much enjoyed the butchery course. Everything about it - facilities, teachers, food (Yum) - was wonderful and the whole thing very good value for money.em>"
"It was a fabulous weekend guys. You must be very proud! You were great hosts and it was a joy to be in your company." "What you are doing in Croan Cottages is absolutely wonderful & your recognition and support of other local artisan suppliers is commendable." "Thank you so much for the wonderful weekend. I enjoyed it so much - the food, the location and the fun we had was beyond my expectation." Give the gift of 'an experience'. Gift Vouchers are available for courses or holidays in any amount. This course includes refreshments and lunch and all equipment and recipes are provided. Creating recipes for and making sausages. 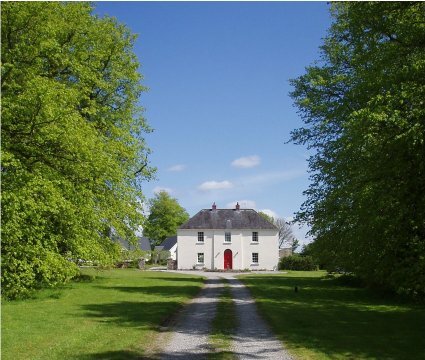 During your stay your host, Francis, will also introduce you to life at Croan. Together you will meet the animals and explore the Gardens. "We all thought your course was great. Eating together and staying in the cottages with other participants made for a different and very congenial experience." "Thank you very much for the fabulous weekend with the two charming guys from River Cottage." "I learnt lots every day and hope to put it all in to practice in the next few weeks." "You really put all your heart and soul into organising and running the weekend." When you send animals to the butcher, you will be asked all sorts of questions about how you would the carcass broken down into various cuts. Declan started in the fresh meat business in 1984 making the famous Superquinn sausages! 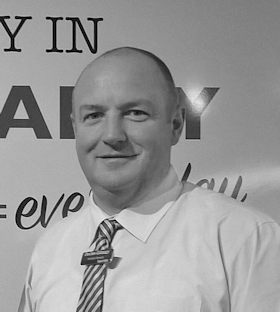 Since then Declan has worked for small butchers in Ireland and Australia. Most recently he has taken his skills into larger retail outlets. Declan is passionate about real, local quality food. This passion has led him, in recent years, to raise, slaughter and butchered his own fowl, turkeys, lambs and pigs for himself and other Smallholders. John has been working in the meat industry full and part time for the last 22 years. During his career John has working as a commercial butcher on beef, venison and pork. John is passionate about self sufficiency and smallholding. He provides and butchers all the meat and fish his family consumes. He is a deer hunter, a keen angler and advocate for sustainable harvesting of wild fish and game.